But the much harder part, for companies and individuals alike, is figuring out ‘How to get there’. There are always fewer resources than one would prefer. Similar constraints apply to us individuals. Who couldn’t use more motivation, time and money to pursue their goals? Put together, the right Vision coupled to a reasonably mapped set of Resources can deliver amazing results. Think of the Apollo Moon missions. You have to know where you’re going and how you’re going to get there to succeed. That’s pretty straightforward, right? So, it should be little surprise that the opposite, a lack of Vision and/or Resources, leads to underperformance — and, eventually, decline. Think Kodak or Xerox. Or third-generation family wealth that has dwindled away to nothing. In a changing world, refusing to change with it is a losing strategy. The grand goal of defeating the Nazis provided sufficient motivation for people to buy war bonds, scrimp on consumption, plant victory gardens, and go without nylon. A large part of our national resources were dedicated to the larger strategy of winning the war. Because of the strategy everyone shared, practically nobody complained of this repurposing as a ‘time of sacrifice’ or as an imposed burden. Here’s why I’m harping so much on strategy: the US is operating without a viable one. The current ‘strategy’ (if we can be so generous as to call it that), is nothing more than “business-as-usual” (BAU). But it can’t work going forward. And the longer we pursue it, the more of our future prosperity we ruin. Having a powerful military consumes a tremendous annual quantity of energy. The US military eats up 100 million barrels of oil each year. By itself, America’s Department of Defense is the 34th largest consumer of oil in the world. 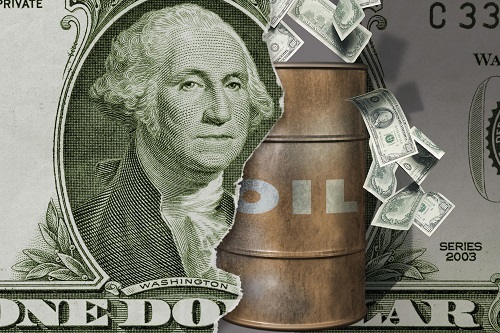 In total, the US consumes over 7 billion barrels of oil each year. And that represents only 37% of the nearly 100 quadrillion of BTUs of America’s annual energy consumption (the rest coming from natural gas, coal, and other sources). For comparisons sake, the rest of the world consumes another 450 quadrillion BTUs. Will our energy production be able to keep up? As I’ve been warning for years, it will be very challenged to do so — or, to do so at prices anywhere near as low as today’s. Putting those staggering figures aside for a moment, let’s focus on one — just one! — of the crises ahead of us when it comes to our future energy needs. The nations of the world have made the truly regrettable decision to build so much of their infrastructure using concrete reinforced with steel (re-bar, mesh, etc.). As I’ve explained in detail in previous articles, because the steel rusts over time, the concrete is busy being destroyed from the inside out — something we can detect easily enough by the cracks and spalling (sheets flaking off) so readily apparent on every bridge that’s more than a couple of decades old. This has created a ticking time bomb. The world’s crumbling concrete buildings, bridges and roadways will have to be entirely replaced in just 40 to 100 years of their original construction dates. Where will all of the energy come from for that? Given that the sand required for all of the world’s *current* concrete projects is now in very short supply, where all the sand will come from for all that future concrete and cement work? Who ever thought we could run out of sand? But such are the unpleasant surprises that crop up during the late stages when running an exponential economic paradigm (i.e., “Growth forever!”). And it certainly doesn’t help that we’re remaining willfully blind to our situation. Yes, Texas produces oil and natural gas. But the US is still a net oil importer to the tune of about 3 million barrels per day. The US is not independent with respect to oil. And it won’t be until it produces another 3 million barrels per day (and that’s making the generous assumption that consumption remains flat). In my world, NEVER AGAIN is a lot farther out into the future than 2025. But Mr. Abbott has apparently ingested one too many petroleum sales pitches and received a terribly inaccurate impression about the true state of the US’ energy predicament. Finally, even if the US were a net oil exporter (highly unlikely), we’d still be tied to the world price for oil. Should foreign cartels decide to limit production and spike the price, that would still effect the US. So we still wouldn’t be “independent” of their influence. But sadly, Mr. Abbott speaks for the nation in that tweet. We’re “swimming in energy” and need not have any worries. The drum of our chest-thumping will scare them away. There’s no acknowledgement of the challenges we face in the coming decades, of declining net energy per capita. Of greater competition between the developed and developing nations for the remaining BTUs. There’s no compelling Vision to marshal the public towards what fits the realities of the future. We could, and should, be working on solutions for entering a “post-growth” era with grace. Or at a minimum, aggressively using today’s Resources to create a new energy infrastructure that plans for the inevitable decline of fossil fuels. It’s beyond dispute that fossil fuels are 4/5ths of the current total global energy mix, that our use and dependence on them has grown exponentially over time, and that they are a non-renewable resource. Among the fossil fuels, oil is, by far, the most critically-important to sustaining both our current level of technology and the human population. It’s how we move virtually everything from point A to point B and it’s a critical element for food production and distribution. It also remains absolutely essential to the manufacture and installation of alt-energy systems, like wind and solar. First, identify all the energy demands that absolutely have to happen just to maintain systemic integrity. The DoD has needs, the current fleets of emergency vehicles and school busses have needs, as does maintaining the existing stock of bridges, roads, and buildings. This exercise will reveal to all that simply maintaining ‘the way things are’ is extraordinarily energy-expensive. But it has to be done if we want to avoid economic collapse and massive joblessness. It also bears mentioning that the energy required to keep things going is energy that cannot be dedicated to building the new future. It’s a sunk-cost of prior decisions. Next, develop the very best possible estimate of total economically recoverable fossil fuels. Do this by finally measuring the full-cycle energy returned on energy invested (EROEI) for the remaining deposits. After all, we’re going to build out the future with the surplus energy extraced, not the gross (surplus = Total BTUs extracted – BTUs expended during extraction). This estimate will represent the total principal balance of our national energy bank account. Last, calculate if there will be any energy left over. If so, save it for future generations. They’ll have their own sets of needs and desires that we can’t possibly know today. (Sadly, I’m willing to wager that there won’t be any excess fossil energy to pass along). Next, we’d realize better that our chances of manifesting the Vision are improved by limiting the amount we spend on maintenance. That insight would help to spur better decisions around conservation and efficiencies — such as not driving 6,000 pound private SUV/Truck vehicles to transport a single passenger to a desk job, or building homes with inadequate insulation to save a few thousand dollars on the front end of a 100-year capital investment. Finally, we’d appreciate how our energy resources are finite and limited, and that how we choose to utilize them is quite possibly the single most important decision society can possibly make. Leaving the fate of our precious energy resources to the short-term interests of the markets and politicians would suddenly look too risky and nonsensical. We’d agitate for greater stewardship of them. It’s so powerfully embedded that Ford Motor Company recently decided to scrap selling sedans and small cars in America. It will only manufacture SUVs, trucks and commercial vehicles. You know when Ford will no longer make cars, they’ve got to have really chugged the shale oil Kool-Aid to make that decision.